My husband, Pete, loves everything about wild blueberries. What’s more, he can zero in on anything having to do with wild blueberries within minutes of entering a source’s periphery. You might recall the exchange he had with a weather-beaten old sourdough in a downtown Anchorage bar that led to a “secret” location that promised great picking. Or you might remember that he is the proud owner of an ingenious blueberry-picking scoop which makes the tedious picking process an enviable pleasure. So, blueberry-picking is always on the to-do list for any summer trip northward. On this latest trip, Pete spent almost an equal amount of time picking blueberries as he did fishing. Before he picked nary a one, he made sure we bought whipped cream with our groceries. Now that’s optimistic dedication! Blueberries have global, inter-species appeal. Back when I was a high school exchange student to Norway, we spent a week at my exchange family’s historic farm on the Swedish border. Their Boxer, Trinë, bolted from the car the minute we pulled up and disappeared into the woods. She returned about an hour later with muzzle stained purplish blue. I witnessed Trinë’s exuberant technique throughout our stay: bound through the woods with your mouth open and enjoy blueberries on the run. Pete had stumbled upon the promise of a great blueberry patch as imparted by a waitress at our previous afternoon’s watering hole. Sensing a pattern here? Bar – conversation – blueberries – secret places? Yep! Blueberries like sunny, open areas, such as those that have been recently burned or logged. Two varieties are found in the Minnesota North Shore area: the upland – which grows in rocky, well-drained areas and tends to be sweeter, and the lowland – which grows in transitional, boggy areas, and tends to be slightly more sour. We had seen earlier evidence of other Gunflint Trail blueberry lovers. Pete’s photo proves that bears really do you know what in the woods. This bear’s calling card was provable evidence of a veritable blueberry feast. In a moment of deja vu, I realized that our efforts might result in an encounter I’d just as soon avoid. We’d set off up the Trail from Grand Marais fairly early with all due speed. Our mission came to a rolling halt about 45 miles in, however, as light traffic slowed ahead of us around the turnoff to Ham Lake, site of the 2007 fire. This area promised good picking: white, rocky patches were still visible in the terrain amid the re-growth. If any blueberries were to be ours, they’d be the sweeter. While we crept along, wondering just what the fuss ahead was all about, I noted the map showed a curious name just across the Boundary Waters wilderness line to our west, and along the line on which the fire had spread: Missing Link Lake. It didn’t dawn on me at the time, but thinking back now, I find the name remarkable. I think I was meant to see it. Just then, we spied a wolf pup by the side of the road. So thin his every rib stood in high relief, he was clearly in distress. “Oh!” Pete exclaimed. In one syllable there was the wonder of actually seeing the wolf and the acknowledgment of how cruel nature can sometimes seem. Then, more quietly: “He’s not in good shape.” Looking at us with glazed eyes, panting in the heat, the skinny, dirty pup turned and staggered a short distance along the narrow shoulder before disappearing back into the brush. I was disturbed and unsettled. The little wolf was separated, disoriented, and not long for this world. A few years prior, I had dreamed of wolves. In the dream I had awakened and looked out my window to see twenty or thirty white wolves stationed silently, calmly returning my gaze. It was a time of great emotional turmoil for me then as well. I remembered wondering what the dream meant, but not wanting to know if it portended more upset. The dream’s peaceful, yet mysterious, imagery layered itself over this real encounter as we resumed speed. 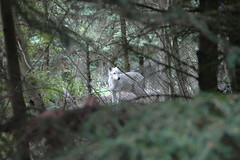 On hearing the stories of this trip, my friend Hinda provided information on what the wolf encounter might mean. Wolf: guardianship, ritual, loyalty and spirit; when a wolf shows up, it is time to breathe new life into your life rituals…find a new path, take a new journey, take control of your life. WikiAnswers reveals even more: Wolves may appear in dreams when one has lost faith on a quest for something; the wolf appears to guide them and renew their hope. As a totem, wolf is a teacher and pathfinder, he comes when we need guidance in our lives. Those who have a Wolf Totem will move on to teach others about sacredness and spirituality. Wolf can also teach how to balance the responsibility of family needs and not to lose one’s personal identity. . . Wolf teaches us to develop strength and confidence in our decisions. He shows we will learn to trust our insights once we learn how to value our inner voice. . . If wolf appears in your life examine where you need to develop more confidence and if you need more balance between friends, family, and yourself. Wolf. Missing Link Lake. Our intention with this trip had been to think about what to do in the next phase of our life together, and once again we’d received an affirmative sign. Further, the vivid symbolism in my dream appeared to point toward a hopeful renewal out of some very painful moments. This positive change had, in fact, occurred some months later. Pete pulled up along an inland track that looked promising. I still couldn’t shake my unsettled mood. The Forest Service publication we’d picked up reminded that berry pickers should stay “aware of bears that may be in the area feeding.” I decided I’d stay in the Jeep and read my book while he set off. I won’t lie. After about 45 minutes, I was getting nervous. I was very relieved when Pete appeared, approaching at quite a brisk lope. With a grin, he showed me his bucket full of fresh, sweet berries. I mentioned that while he was gone, my imagination had jumped to a print I had once owned by Bev Doolittle, titled “The Forest Has Eyes.” I wondered whether he’d felt as though he were being watched by anything, and told him that I hadn’t been able to shrug off the creepy feeling I’d had since the minute he’d set off. Pete said no, he didn’t feel creepy until the bucket was almost full. “I decided I had enough blueberries for today when I almost stepped on a four foot long garter snake.” No wonder his pace was a little quick upon his return! Hinda’s source tells us Snake: death and rebirth into new powers of creativity; resurrection, initiation and wisdom, transition. We had lost Pete’s mom just prior to this trip, and we were hoping to take a break from stress. We’d intended to decide what we were going to do next. We knew our decisions would include the creative businesses we had already begun, and more than likely we’d commence new endeavors to complement them. In Native American spirituality, the snake represents the opportunity for transformation and healing. It brings rebirth and resurrection, and offers wisdom and initiation into a new life. As we release that which no longer serves us, it dies in our lives, making way for something new to be created, to be born in us. Of course, late on this particular afternoon, tooling back down the Gunflint Trail with a bucket full of blueberries, we knew none of this. We’d had a full day, and we were looking forward to pie. Back at our campsite, using a prepared crust to line foil muffin cups, Pete ladled in fresh blueberry filling he’d made by adding sugar, lemon juice and a little flour for thickening. Sealing the little pies with sections of crust arranged so steam could escape, he placed them in the cooking pan. The camp oven is an ingenious solution for baking over a propane stove or hot coals alike. Pete has used ours for bread and muffins as well as blueberry pie. The silver fabric creates a warmer that allows the heated air to flow around what’s cookin’. That night we ate fresh blueberry pie with whipped cream as the twilight faded into night. Now that we’re back, I’ve spent the weeks intervening examining meaningful facets of this trip. The more I review, the more there is to ponder and appreciate. I’m convinced our experiences and encounters converged to send us a series of reassuring messages. And the more time passes, the more I am certain that all will be well. Too bad you couldn’t have given the wolf pup some blueberries. I love the image of the boxer bounding through the woods with his/her mouth open. Do you suppose that’s how bears do it? I’ve always preferred raspberries to blueberries, but those blueberries pies are making my mouth water. You’re in luck! Wild raspberries grow off the Gunflint Trail, too. I am not sure exactly when they ripen, but wouldn’t it be a fun trip regardless? Hi Betsy .. the bear sure enjoys his blueberries and knows where to go for them! It’s like the seagull guano at this time of year .. purple – probably from the elderberries. Maps are wonderful aren’t they .. with their names .. and the poor wolf pup – but nature is nature. Your dream sounds amazing .. you must have some connection .. because your dreams are so real. Your poor little cub .. no w you two being the pathfinder, that he never would be .. a time to look for new ways forward .. an interesting journey, but where you’re in control. No-one warned you .. beware of the snakes? .. it reminded me of when I was a tot – 5 or 6 .. and we were picking blackberries in the heathland in Cornwall .. and I stepped on a snake .. it uncurled itself under my little feet & I ran and ran for the bus stop .. our child minder had a bit of a hassle with my brother in his pushchair and me haring ahead to the road .. some distance! Not happy was I with that snake .. The logic in the snake representation of we release that which no longer serves us .. it dies .. and makes way for something new … Amazing how the symbolism and spiritualism of the animals came to help you both through this troublesome time .. I’m sure all will be well for you – times change and life is unknown and that can be unsettling .. but in due course all will be well. The blueberry pies looked delicious .. and whipped thick cream too .. too wonderful .. and how lovely sitting in the twilight eating warm pie .. as time moved slowly on into night ..
Hi Hilary – We’re not fans of snakes, either. It’s interesting to me, though, to know the correlation and it made me think of the snake shedding its skin, etc. I have learned so much about the role of animals in spirituality doing this series. There is more to come, if you can believe it. What a trip! The dream was amazing and so vivid I can remember it as if I just awakened. I think all of us have several dreams during our lifetime that create a similar, strong impression, whatever they may be. All is certainly as well as it can be – things seem to be about going with the flow, as you certainly are well aware. Thanks. The little wolf part broke my heart. The blueberries though sounded awesome. And the snake? Well, let me just say, I still remember every detailed vibration of my memory of the time the snake slithered over my bare feet as it traveled on its way to somewhere else while I stayed glued in fear to my spot standing next to a tree watching it in terror. Whatever message it may have been trying to impart was lost in the silent screams I swallowed in my throat as I watched it slither over my toes. Hi Betsy .. Dot put in the bit I forgot about your visit to the Norwegian/Swedish border .. must have been so interesting … and the boxer piling off into the undergrowth .. like a dog-whale spooning has he went – lovely to imagine. Pete – you take wonderful pictures .. the pearly everlastings = such a wonderfully descriptive name ..
Hi Hilary – Isn’t that a great name? Pearly Everlasting. What a great name for a character in a book, too! Thanks. Hi Betsy .. the honeysuckle photo worked wonderfully – thank you! Pearly everlastings – as you say glorious name – you can see the flowers with their pearly sheen .. I love blueberries… except for the blue teeth they leave behind. They’re especially good with fresh white peaches…. among other things… many other things. I was staying at my sister’s farm about 6 years ago, lying in bed late one night. I could hear wolves howling. It gave me the chills; in a good way. Hi Davina – The sound is something you never forget, isn’t it? One year camping on Minnesota’s North Shore, we heard howling wolves as we lay inside our tent late that night. Betsy looked at me and said “Is that what I think it is”? It was and we both smiled having shared something new and something wild. I always expect to hear it again when we go up there, but no such luck. But the memory lasts forever and that about as good. I enjoyed the sound of the wolves. Though… I was nestled safely in a bed inside a house; not in a tent like you two were. It is quite a sound isn’t it? Did you hear owls? Or loons? We’d often hear owls at 2 am when sleeping in the tent. Sigh. Great memories. No so much on owls, but I grew up with the various calls of common loons. And it is always a special moment. We have a loon pontoon at the family cabin. So we are lucky to have loons in our bay all year. Most wonderful. Thank you for sharing this great adventure and the pictures were all the whipped cream that I needed! My family eats very well when camping, but Pete has us beat! What an amazing time. So much to absorb as you two transition to what Greg and I call “new stuff, new stuff!” Love how you weave in the animal spirit lore. We have yellow and red racer snakes here in Colorado. They don’t go away from you, but go wherever they want, including directly toward you. I grew up with three older brothers, so I had to develop an immunity to all things scary early or be always jumping out of my skin. Hi Lori – I don’t know if I’d like a racer coming straight at me. In Michigan we had blue racers – seemed huge to me as a child. Yes, we’ve had a lot to absorb. Through it all these reassuring signs have been plentiful. It’s all good.